DraftKings is the biggest Daily Fantasy Sports website in the world and regularly offers prize pools of over $1 Million! Love the thrill of Daily Fantasy Sports in Australia but crave bigger contests and even larger prizepools? That day is finally here as international DFS site DraftKings have now opened their borders to include Australian customers! See our full review of the DraftKings website and its features below. If DraftKings do turn their attention down under, here's a measuring tool for just how monumental this move could be for fans of Daily Fantasy Sports in Australia...DraftKings will pay out over $1 Billion in prizes in 2017 alone, and every week at least one DraftKings player becomes a millionaire. Being an American based company, DraftKings’ bread and butter is obviously their American sports. They offer a wide range of tournaments in all four of the major US Sports as well as the college iterations of Basketball and Football. They also offer Golf, MMA and Soccer tournaments. 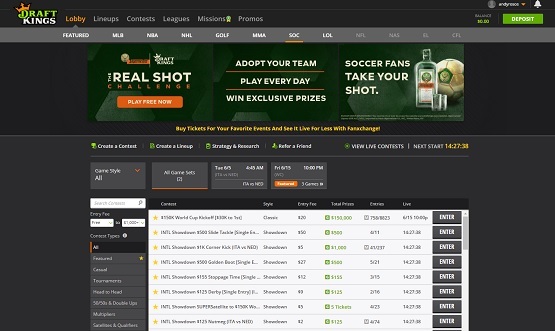 If you’re familiar with any Daily Fantasy Sports website then navigating the DraftKings site wont be an issue. It features a standard lobby page that you’ll land on when entering the site, and from there you can use filters to navigate your way through the hundreds of tournaments in different sports to find the one you’re looking for. Once you’ve located the competition you wish to enter, it’s up to you to select your team. Salaries and some scoring systems differ a little bit to what you might be used to at Australian DFS sites, but the concept is exactly the same. DraftKings also offer a great live game centre where you can track the progress of your teams in action and see where you stack up on the live leaderboard. The feature that sets DraftKings apart from the rest, however, is obviously their prize pools. If Australians are able to share in the same contests as the rest of the world, then Aussie punters will have the chance to become millionaires on a weekly basis. It's life-change stuff, and is a massively exciting step for DFS in Australia. For Australian customers, DraftKings offer a range of different payment types for depositing. PayPal, Visa and MasterCard are currently available while local payment and wire banking options will become available in the future! Editor’s note: Take care when signing up to new sports betting agencies. Be sure to read all terms and conditions of any bonus offers, deposit/withdrawal requirements and identification verification on each respective site, as some of the information on this page may be outdated. not all states are eligible for bonus offers and promotions. Daily Fantasy Rankings will do their best to keep this page up to date, but takes no responsibility for any information on this page being incorrect.